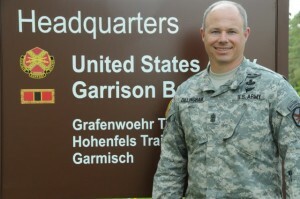 GRAFENWOEHR, Germany — Command Sgt. 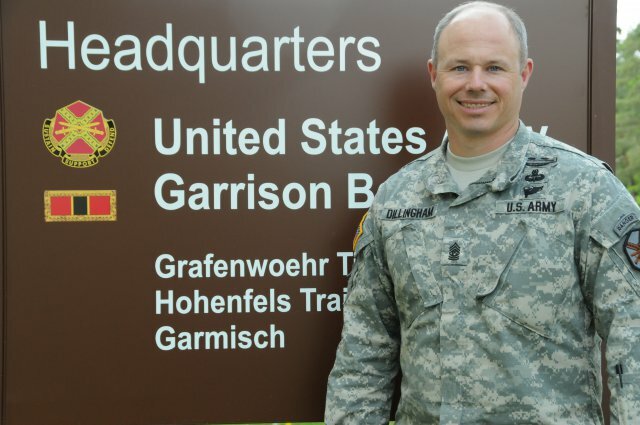 Maj. Jeffrey R. Dillingham has served as U.S. Army Garrison Bavaria’s command sergeant major since Feb. 5, 2014. He shifts responsibilities to incoming command sergeant major, Command Sgt. Maj. Robert Todd, at a ceremony here Sept. 8, 2015. A native of Elkton, Kentucky, Dillingham entered the Army in November 1991 and attended Infantry Basic Training at Fort Benning, Georgia. Dillingham’s overseas assignments include five combat tours in Afghanistan and three tours in Iraq. His next assignment takes him to Fort Hood, Texas, where he will serve as the division sergeant major for 1st Army Division West, the element responsible for training readiness oversight and mobilization of reserve component forces. Bavarian News sat down with him to get his thoughts on his time here. What will you miss most about the USAG Bavaria community? The biggest thing that I’m going to miss is the people. Bavaria is a lot like where I’m from, it’s a farming area and people care about each other. The people have been so welcoming and so nice to me. That includes the workforce, the civilians — both German and American — and the military community here. I’m going to miss the friendship they showed me. What do you feel has been your biggest accomplishment during your tour at USAG Bavaria? The biggest thing I’ve learned is that the garrison is not easy. We’re restricted by money, manpower, and authority. So understanding how the garrison works and how we accomplish things is probably my biggest accomplishment. Remember, before I came here I had little experience with how garrisons operate. This job was an eye opener for me. The garrison is like a jellyfish: You can’t grab it or get a hold of it because it will sting you, but if you splash enough water, you can get it moving in the right direction. But if I’ve accomplished anything, I owe it to our garrison workforce and our community who tell us what they wants and we do our best to meet the needs of everyone. During your time at USAG Bavaria, what is something you have learned that has made you a better Soldier? Patience. The biggest challenge in the garrison is finding the best solution for the entire community. We have a tendency to put band-aids on problems as a quick fix. But that wastes resources and time. So sitting back and finding the best solution for the community — and that might not make everyone happy — is the best way to go. That takes patience. That’s what the garrison has taught me. What changes have you noticed in the Army as a whole or here in Europe over the course of your career? The one constant in the Army is change. The environment is changing and Soldiers are changing. But things are better in a lot of ways. The quality of life is better. The training is better. The facilities are better. Soldiers have changed as well. The 18-20-year-old is different than I was at that age, and that’s because society is changing. Europe has changed too. We’ve lost about 90 percent of our forces over the past 40 years. We’re still trying to accomplish the same mission and it’s just really hard to task manage things. But we’re figuring out how to do it. We are the Army, we adapt to solve the problem we are given. What advice do you have for young Soldiers just starting their Army careers now? Don’t try to be someone else. Be who you are. You don’t have to change who you are as a person to be successful in the Army. And for young Soldiers trying to excel in the military, learn your job and seek more responsibility. The only thing that made me a better Soldier was asking to do more. My leadership saw something in me and they said, “Yes, we’ll give you more.” The more confidence they gave in me the more confidence I got and the better I got.